Yes an official v.s. announcement, now we know for sure this is a fight! DOWN WITH THE KING...or queen. Whatever. It's official! 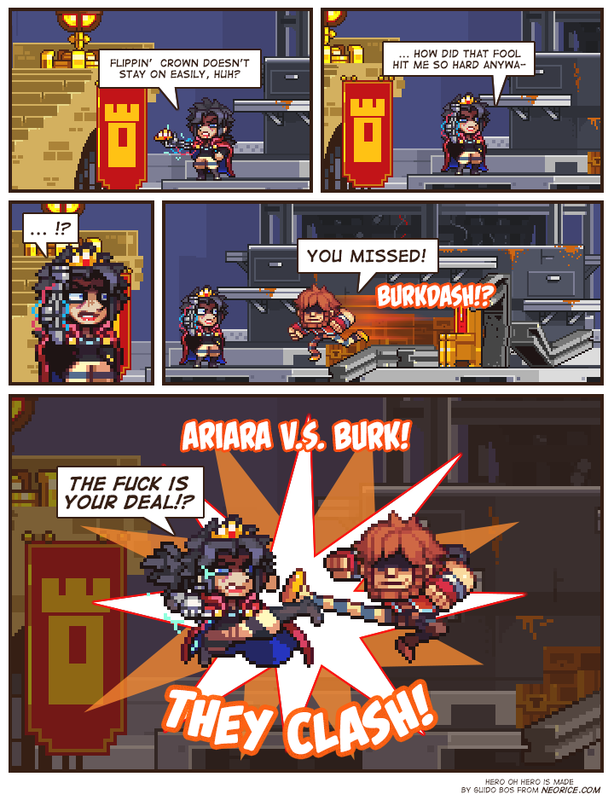 The Burk-Ariara showdown we've all been waiting for! I hope she crushes him. I'm exceptionally tired of his smug grin. I hope a band of minstrels start following him around singing sad songs just to cheer him down. They clash! This is gonna be a fight for the ages, folks. But I don't expect to see Burk crushed. He's wrestled with his brother before so he really knows what he's doing. Also, look at Aria's eye in that last panel. She's totally crying. It's not blue energy at all. Nope. Anyway, is Aria the reincarnation of Vriska Serket or what? So yesterday i said i couldnt wait to see burk get out of it and see pirate's face when she realized that. I hope he crushes her. I'm exceptionally pleased with his smug grin. I hope a band of minstrels start following him around singing victory songs just to cheer him on. Well I'm with Whispers of Sorrow on this one. I hope Burk loses or at least has some serious trouble taking Ariara down. So far he has won all of his fights with ease and hasn't faced any REAL trouble. He's pretty much a god tier character so far, thus I find him hard to be interesting or relatable. I have this feeling that the battle's result is going to be "She lost, but only because of her broken mechanical arm". There's obviously something OP about it, and there's no way having it break right before will be a plot point that's ignored. Burk one-hit KO'd an apparently high-level hero (Logan Alexander) earlier while probably holding back (friendly duel and not-evil). Ariara just took a kick to the face and instantly recovered! If Logan Alexander really was a world-class fighter and Ariara apparently out-classes him so greatly, I wonder how many characters in that world could actually stand up to her? To be fair, Logan himself said he's easy to knock out. Logan is a storm mage, similar to Sunny but lesser. Fighting in an enclosed space (and fighting in melee) was him limiting himself greatly. He could make an entire army's life hell if he wants to.